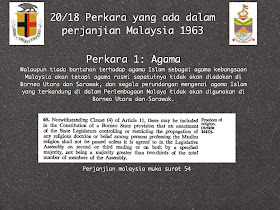 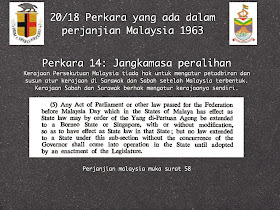 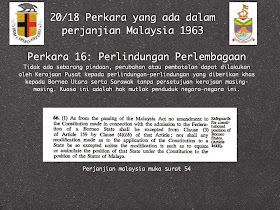 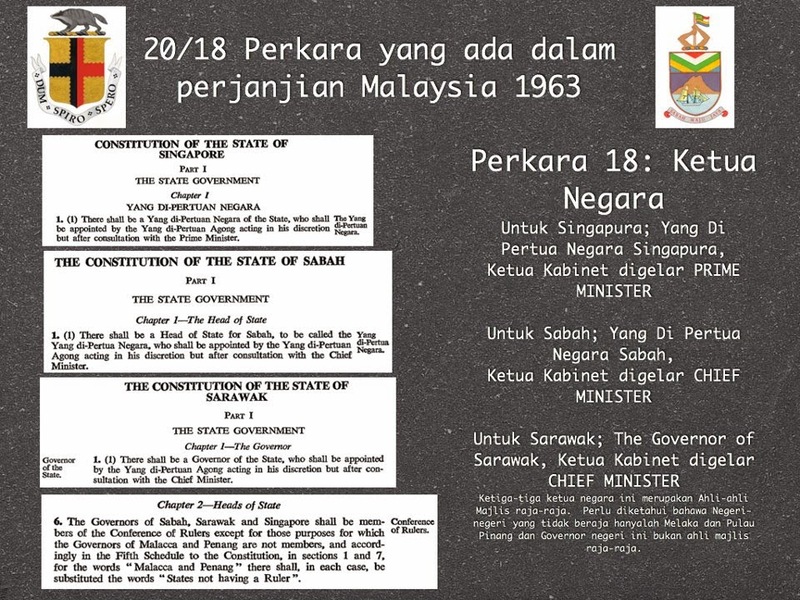 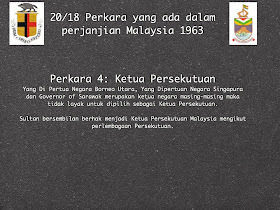 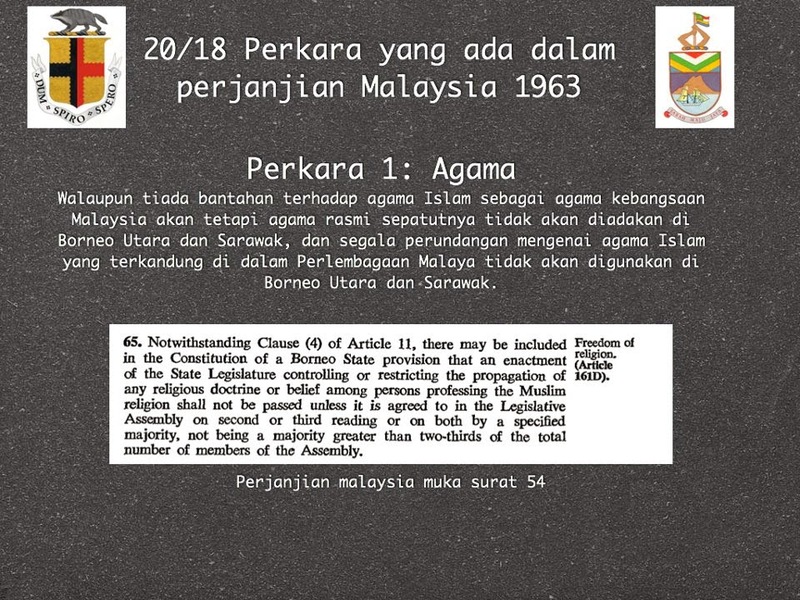 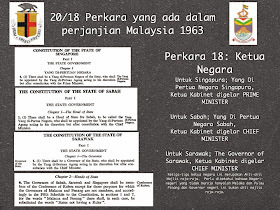 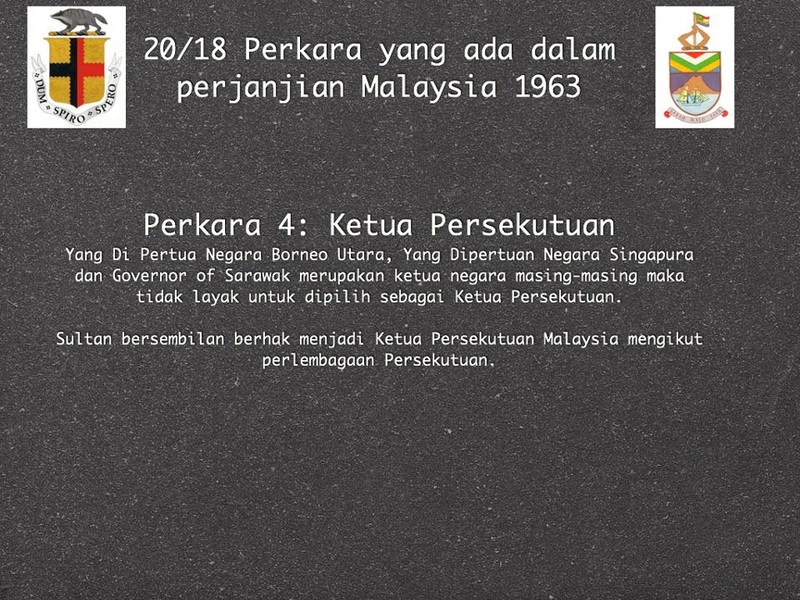 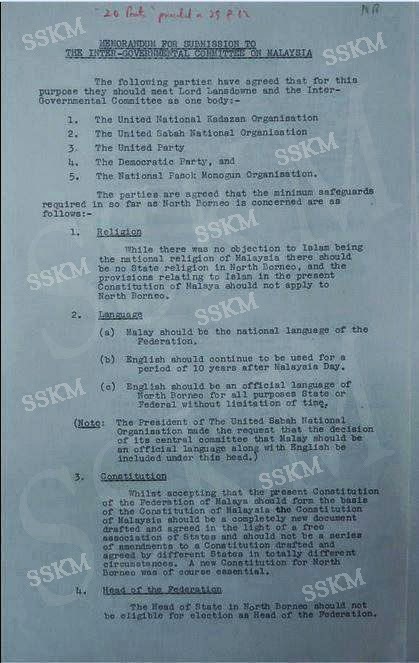 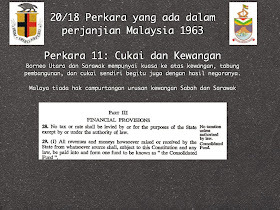 While there was no objection to Islam being the national religion of Malaysia there should be no State religion in North Borneo, and the provisions relating to Islam in the present Constitution of Malaya should not apply to North Borneo. 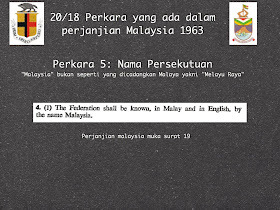 a. Malay should be the national language of the Federation. 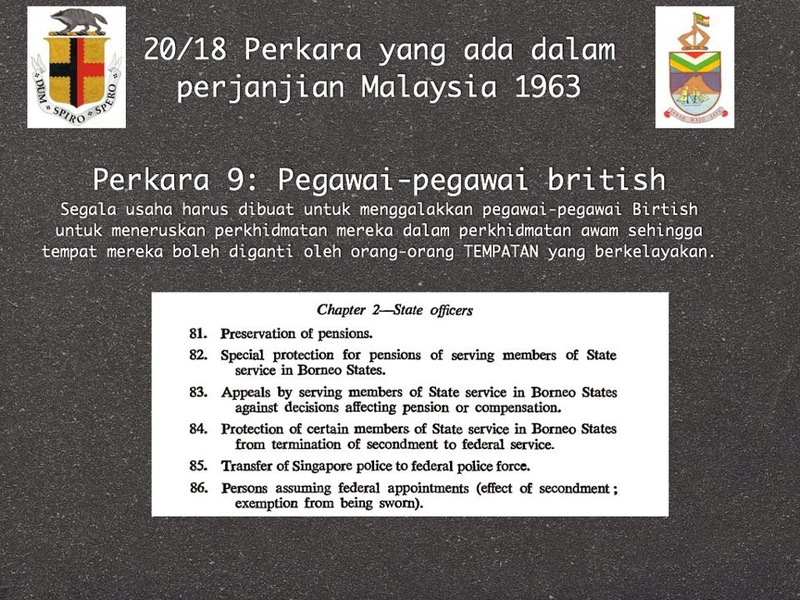 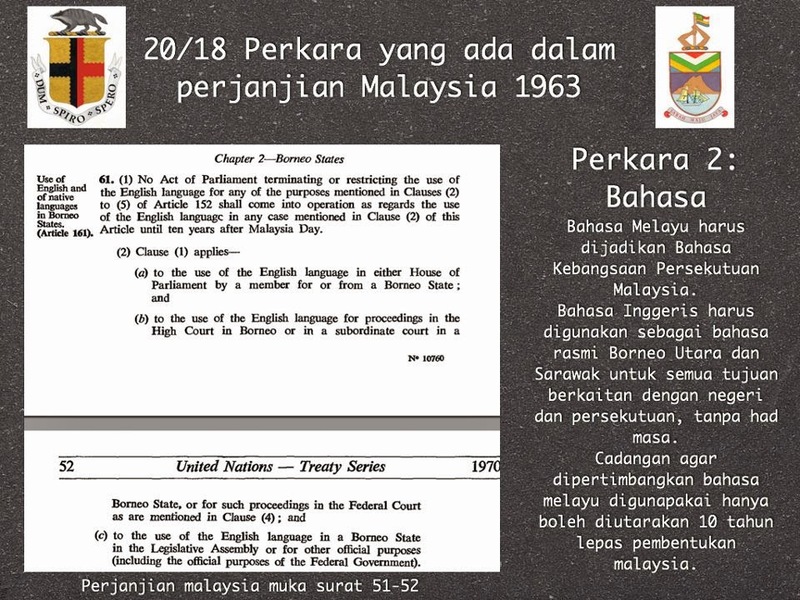 b. English should continue to be used for a period of 10 years after Malaysia Day. 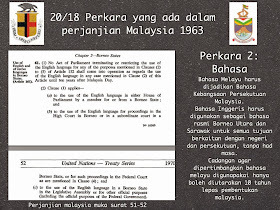 c. English should be an official language of North Borneo for all purposes, State or Federal, without limitation of time. 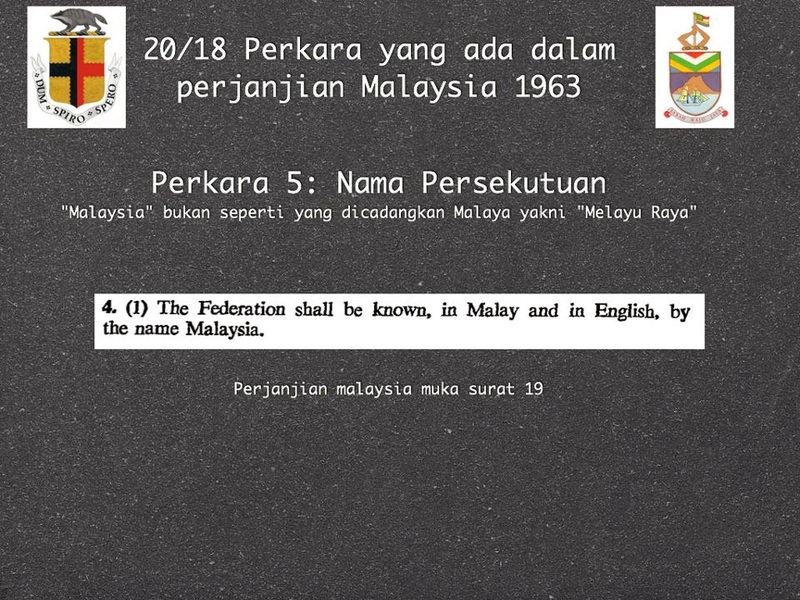 "Malaysia" but not "Melayu Raya". 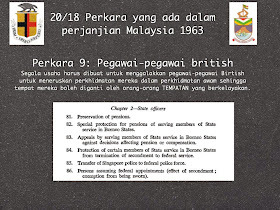 Every effort should be made to encourage British Officers to remain in the public service until their places can be taken by suitably qualified people from North Borneo. 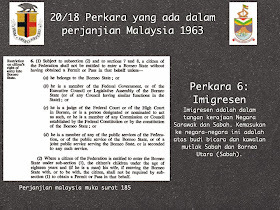 a) sub-paragraph (i) should not contain the proviso as to five years residence. 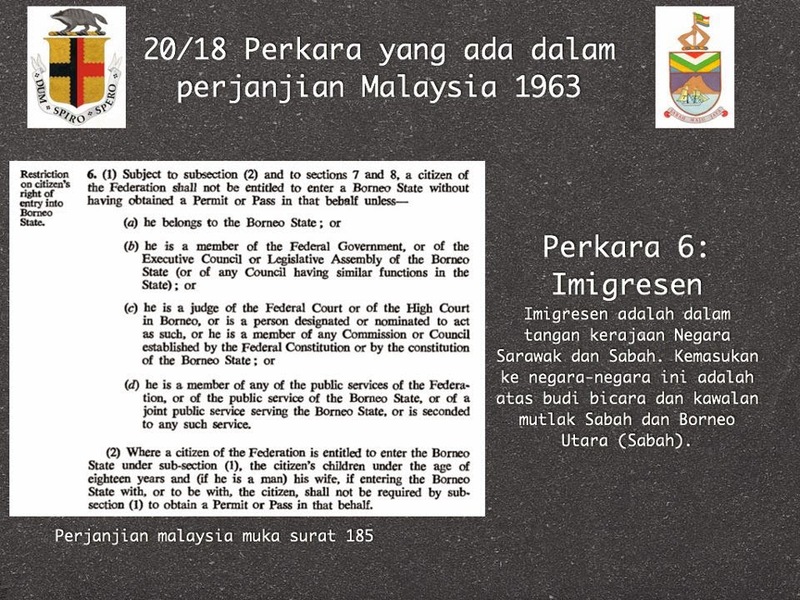 b) in order to tie up with our law, sub-paragraph (ii)(a) should read "7 out of 10 years" instead of "8 out of 10 years". 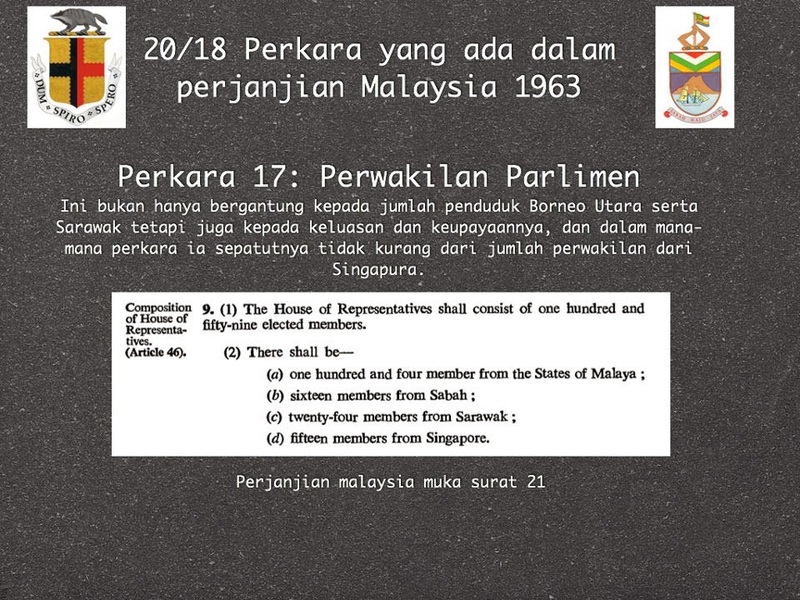 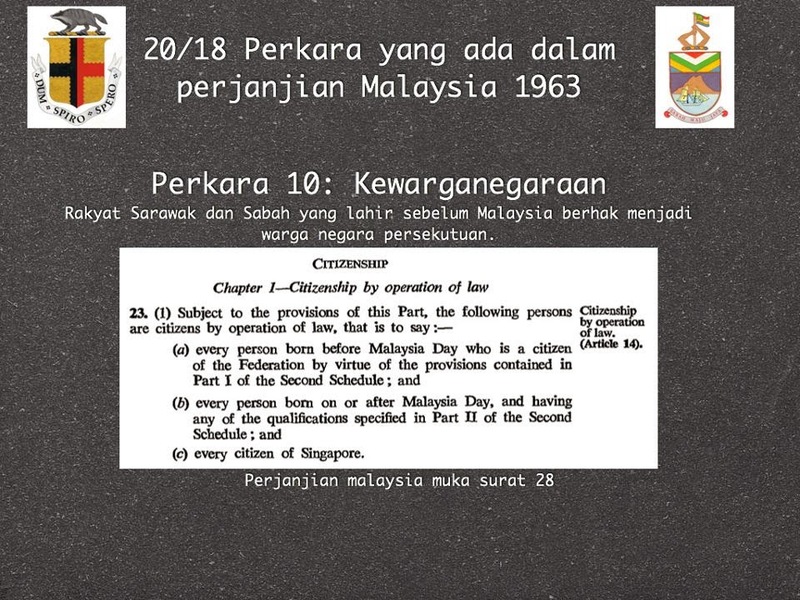 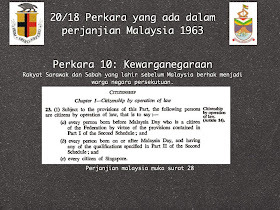 c) sub-paragraph (iii) should not contain any restriction tied to the citizenship of parents - a person born in North Borneo after Malaysia must be federal citizen. 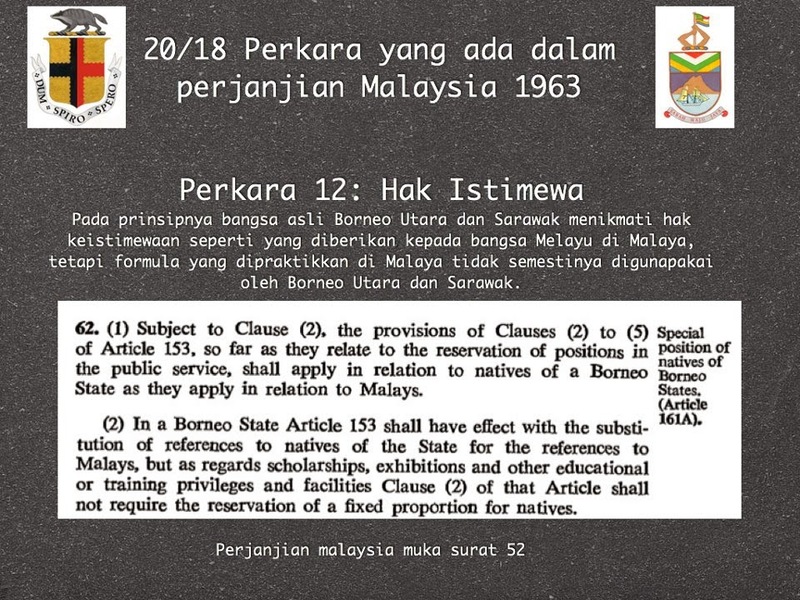 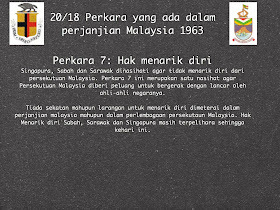 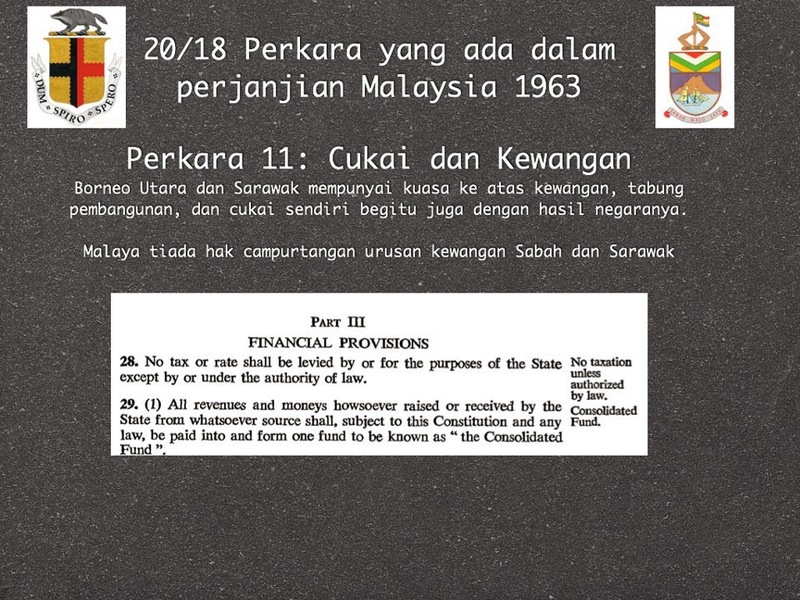 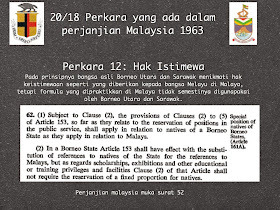 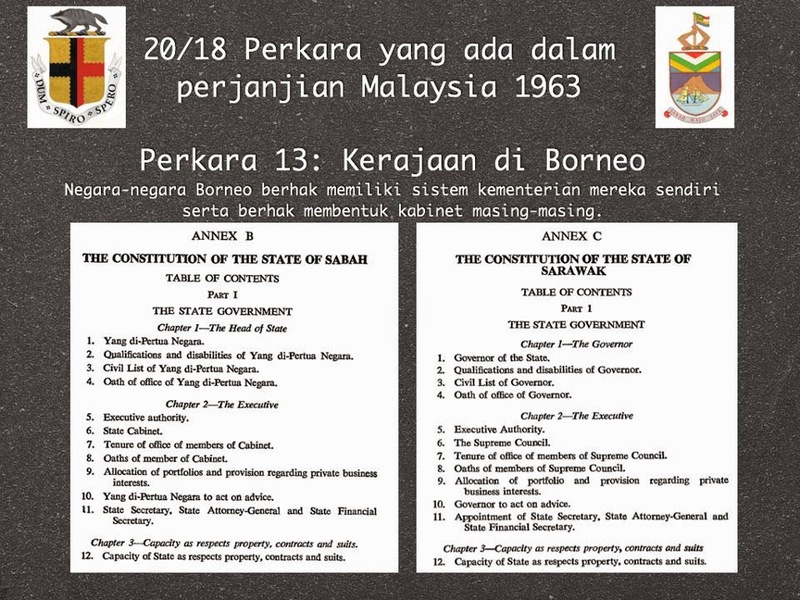 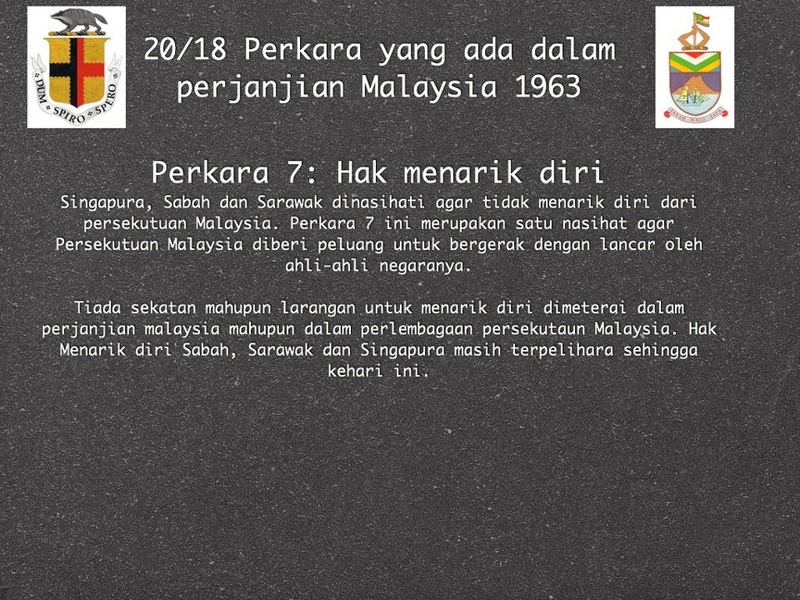 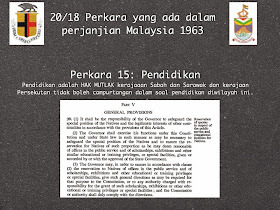 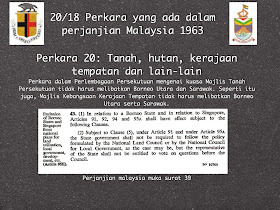 In principle, the indigenous races of North Borneo should enjoy special rights analogous to those enjoyed by Malays in Malaya, but the present Malays' formula in this regard is not necessarily applicable in North Borneo. 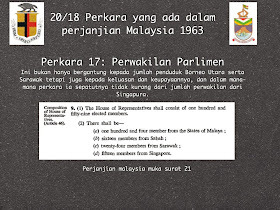 a) the Prime Minister should be elected by unofficial members of Legislative Council. 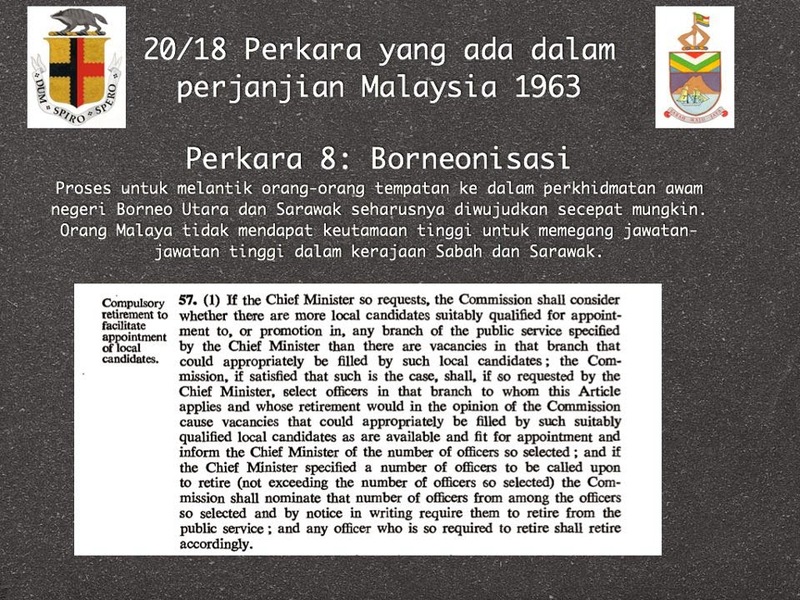 b) There should be a proper Ministerial system in North Borneo. 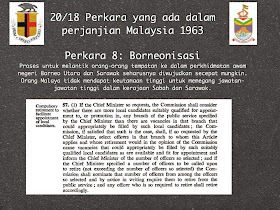 This should be seven years and during such period legislative power must be left with the State of North Borneo by the Constitution and not be merely delegated to the State Government by the Federal Government. 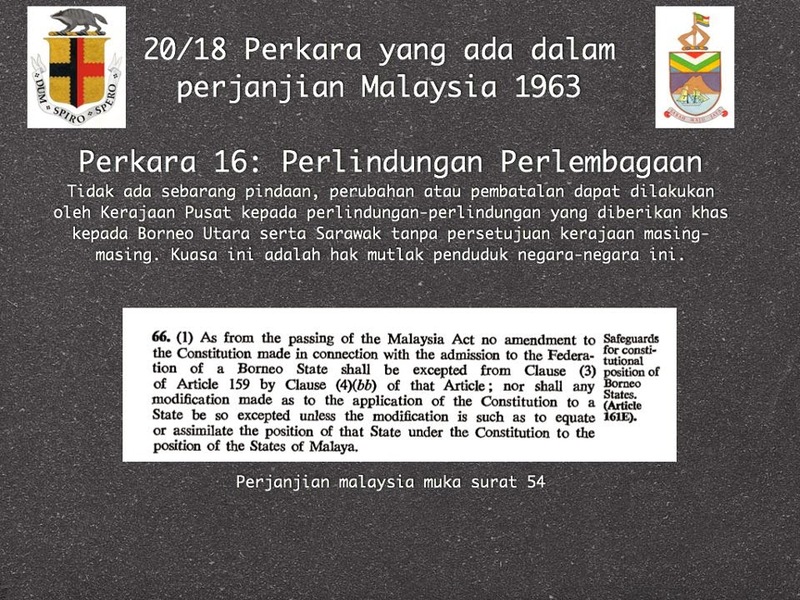 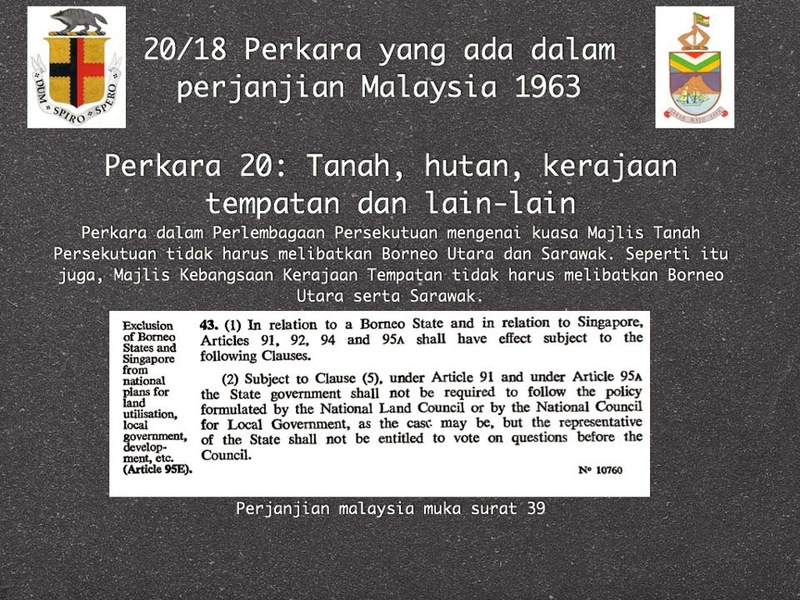 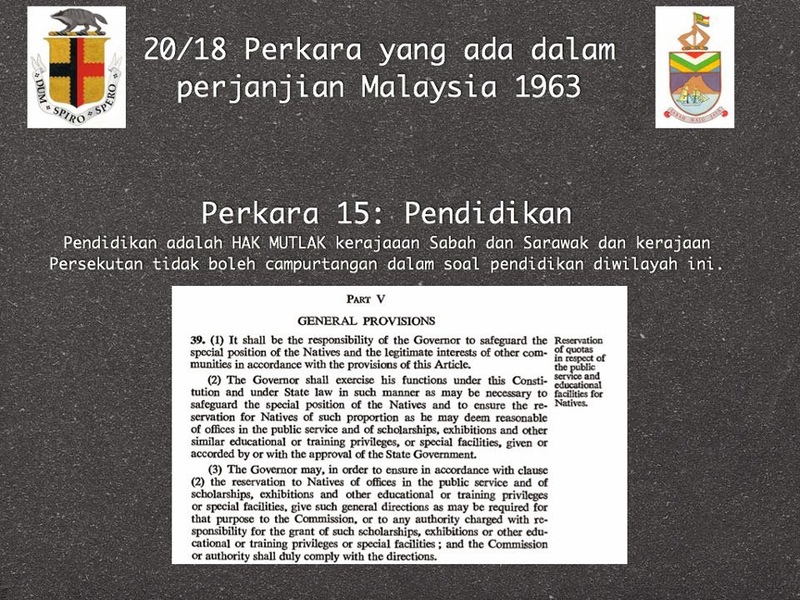 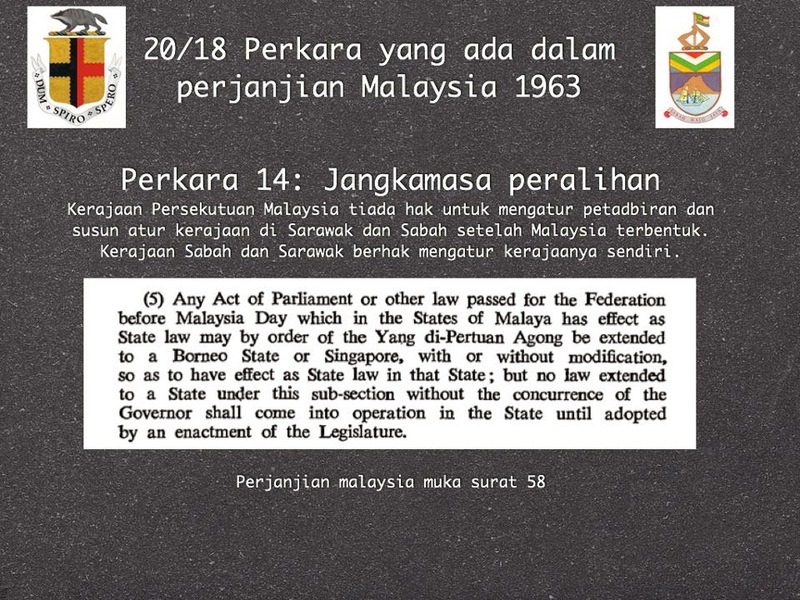 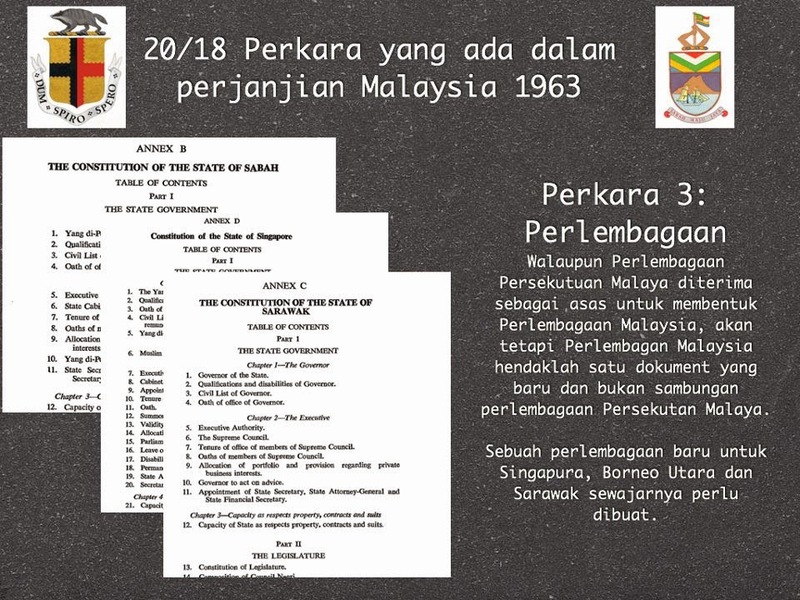 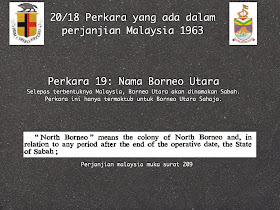 No amendment modification or withdrawal of any special safeguard granted to North Borneo should be made by the Central Government without the positive concurrence of the Government of the State of North Borneo. 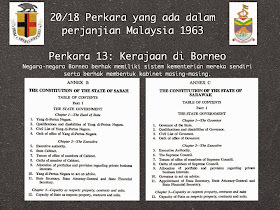 The power of amending the Constitution of the State of North Borneo should belong exclusively to the people in the state. 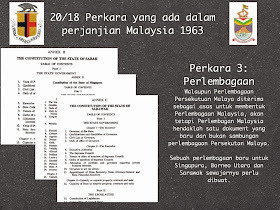 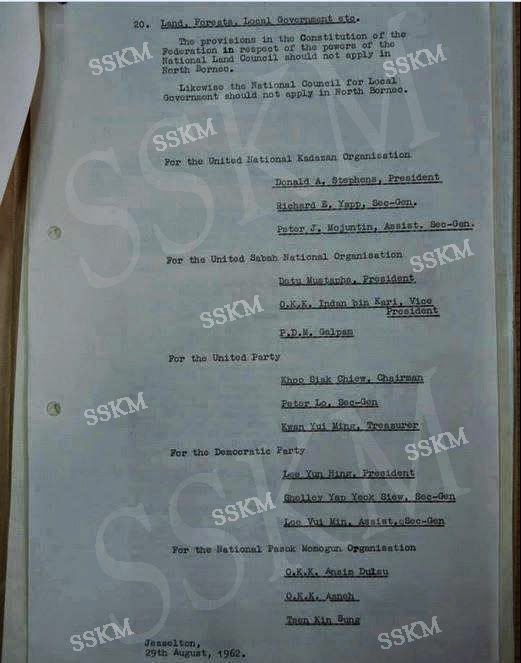 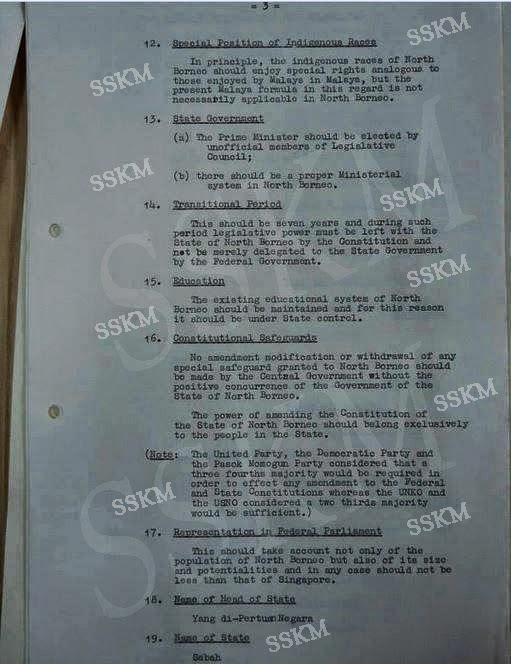 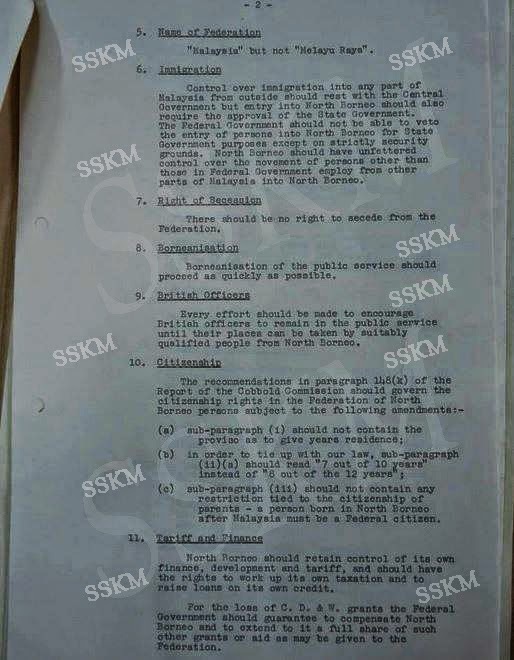 (Note: The United Party, The Democratic Party and the Pasok Momogun Party considered that a three-fourth majority would be required in order to effect any amendment to the Federal and State Constitutions whereas the UNKO and USNO considered a two-thirds majority would be sufficient). 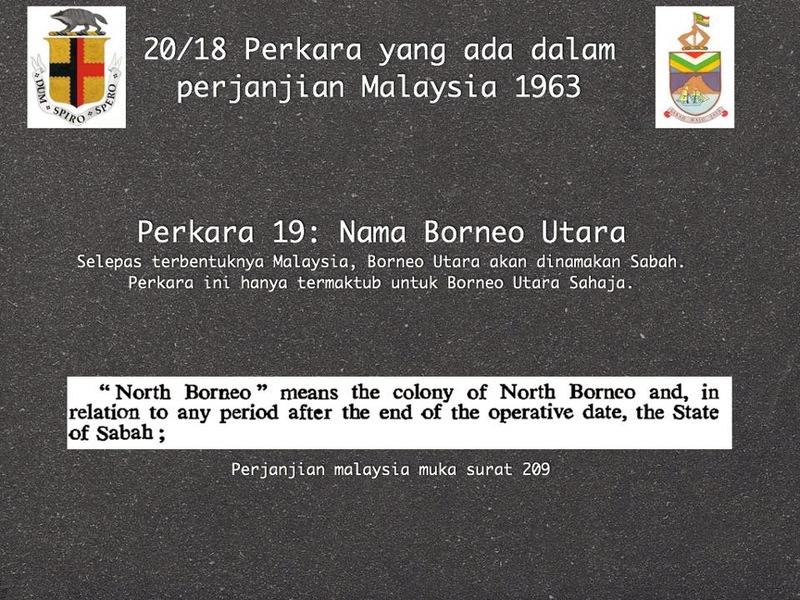 This should take account not only of the population of North Borneo but also of its seize and potentialities and in any case should not be less than that of Singapore.